Barry is a hurricane hunter, flying planes that carry scientists and specialized instruments to conduct research to learn more about hurricanes and hopefully save lives. 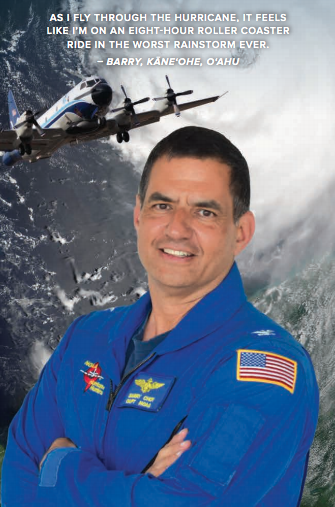 He has been a NOAA Corps Officer since 1989 and has had the fortune to work across NOAA in a variety of capacities, including as a marine scientist, NOAA diver, ship operator, weather forecaster, and aircraft pilot/commander flying into hurricanes. Barry grew up here on Oʻahu in Kāneʻohe and is a proud Kamehameha Schools Alumni and received his B.S. in meteorology from the University of Hawaiʻi at Mānoa. His graduate studies at the Embry-Riddle Aeronautical University distance learning program focused on aviation management with specialties in management and operations.